my Ink well: Happy Anniversary! This card ended up so differently than the original idea I had. I love it when that happens, especially when I end up with extra bits and pieces to use on another card!! I will get to that one later. 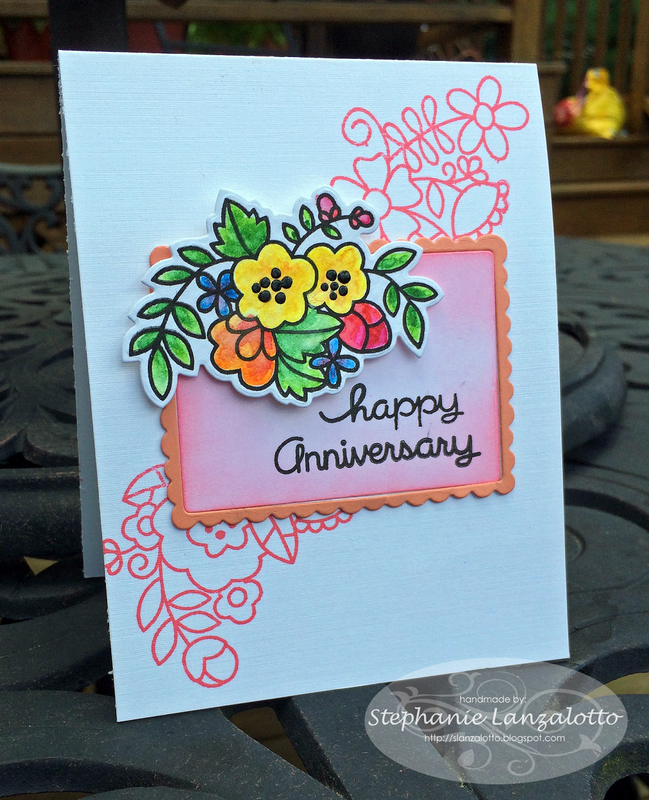 For now, here is my creation for Paper Smooches SPARKS August Anything Goes (wk1) challenge! Thank you so much for coming by today. I appreciate your visit, and I love your comments. Stamps- Paper Smooches Blossoming Buds and Good Gab. Ink - VersaFine Onyx Black, PTI True Black and Berry Sorbet. Paper - PTI Berry Sorbet and Fresh Snow Linen Cardstock, Tim Holtz Distress Watercolor Cardstock. This is so gorgeous. Love how you used those blossoms--as a die cut and also as a background. And the shading on your focal panel is wonderful. What a sweet anniversary card. Reminds me I should pull out that PS set. just one super pretty, lovely card. thank you so much for joining us at the Paper Smooches SPARKS challenge. I have this same stamp set and just made a card with it today. Love how you used it on your card! Everything about your card is so delightful: the stamped flowers, the darling frame and, of course, the stars of the stage, the wonderfully colourful floral cluster! Charming! Absolutely charming!